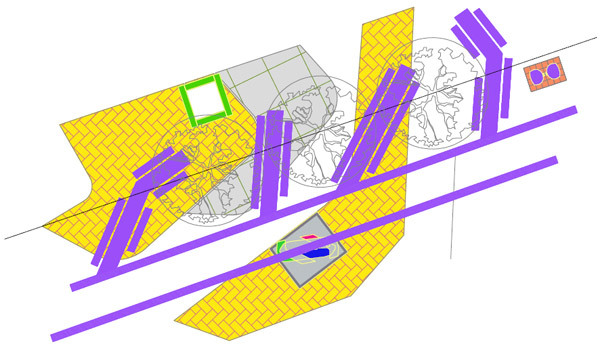 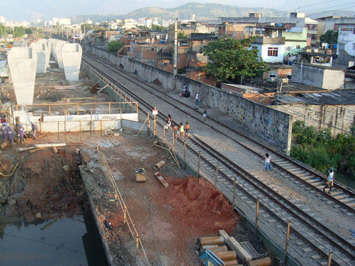 O Projeto se propõe a integração sócio-espacial de um território cindido pelos muros da linha do trem, que parte o complexo de favelas ao meio. 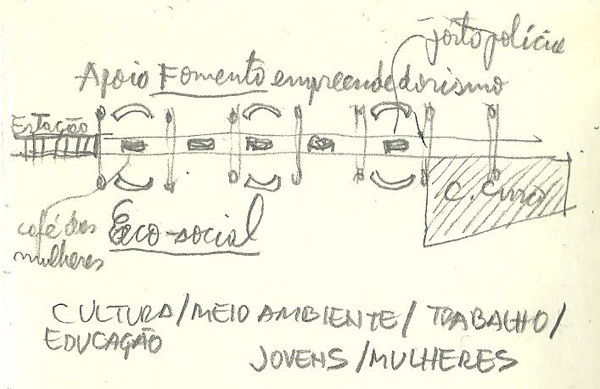 A articulação dos aspectos físicos (urbanísticos, infra-estruturais e ambientais) sociais ( econômicos, culturais, educacionais) ecológicos (ecologia mental, ecologia social e ecologia existencial) na sua interseção com as questões de segurança do cidadão e com as particularidades do sujeito contemporâneo, constitui o marco geral no qual se enquadram as soluções propostas pelo projeto. 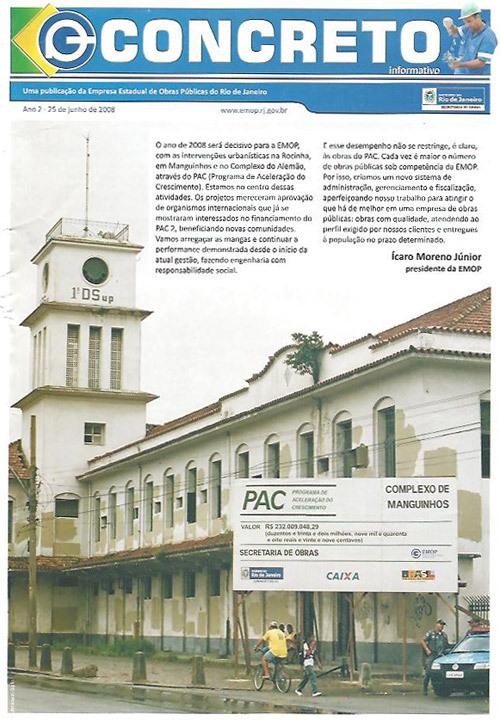 A criação do Centro Cívico reunindo serviços, equipamentos e espaço público, junto com a incorporação de um novo setor habitacional, implica uma reconfiguração das centralidades ao mesmo tempo que introduz um novo e poderoso atrator de convivencialidade no contexto da Zona Norte da cidade. 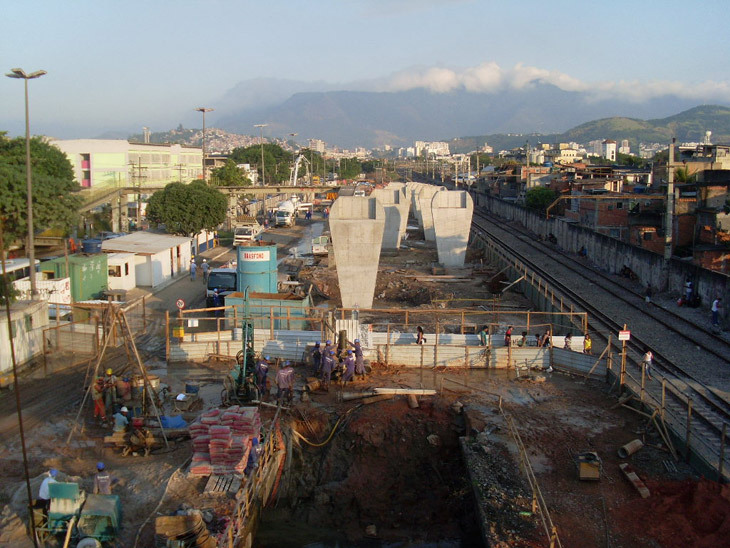 Junto com uma reformulação do sistema viário, da criação de novas condições de acesso ao local, de novas conexões com o contexto e da reconstituição do sistema infra-estrutural (drenagem, esgoto, abastecimento d´agua, iluminação pública), as transformações provocadas modificam completamente as condições de vida no lugar, permitindo uma nova condição de cidadania no caminho da transformação das favelas em bairros populares dotados de espaços, equipamentos e serviços públicos de qualidade. 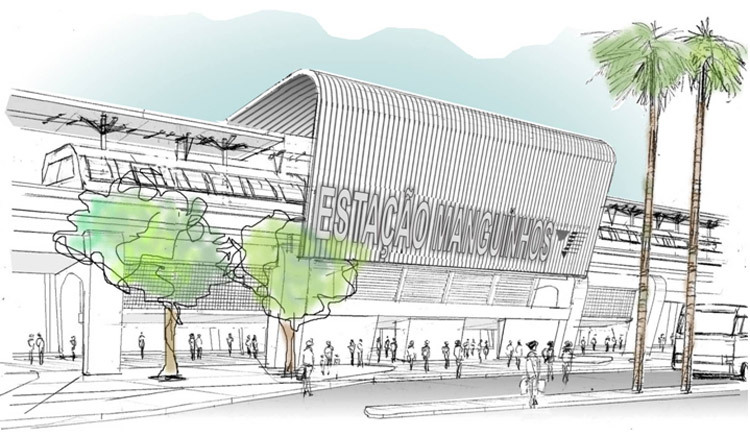 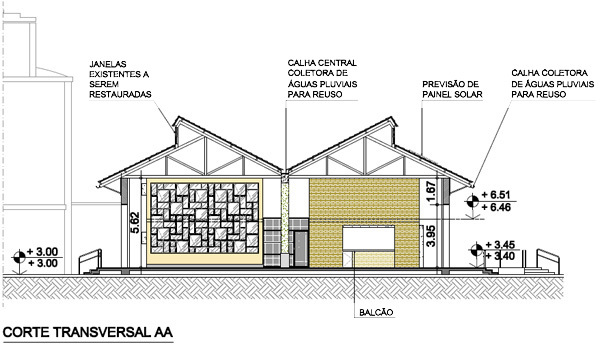 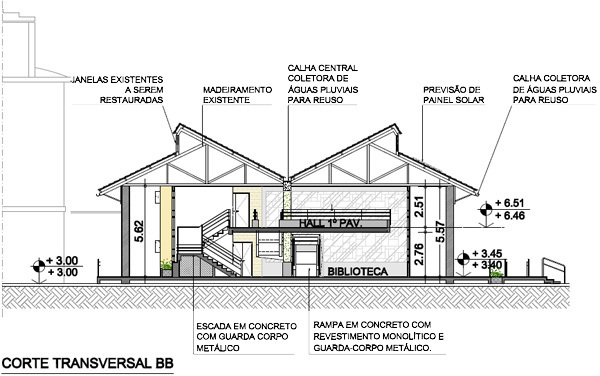 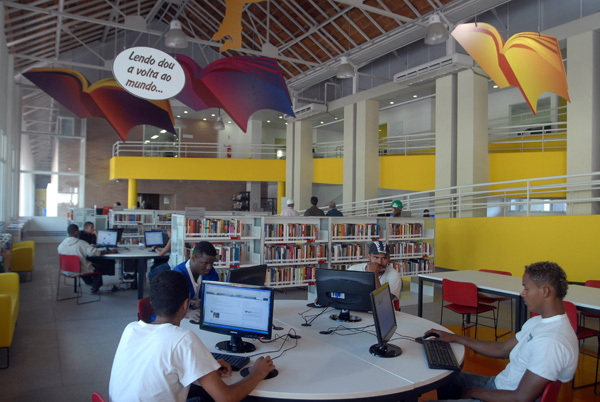 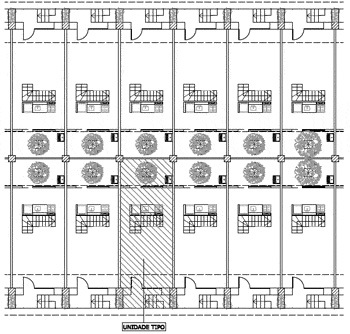 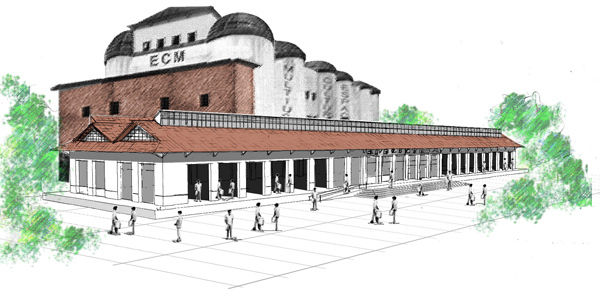 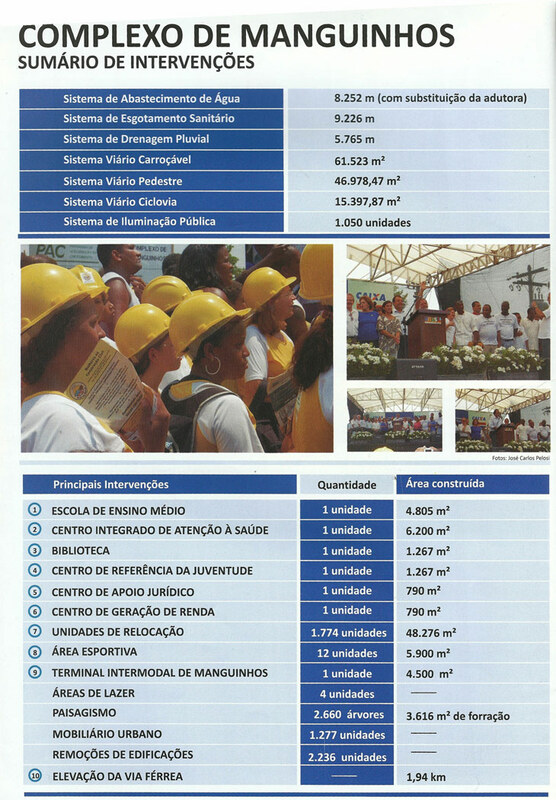 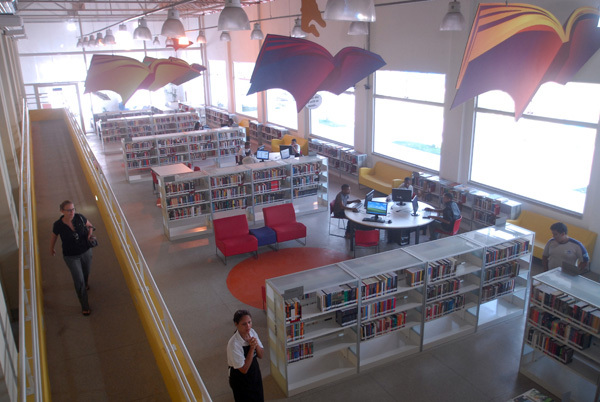 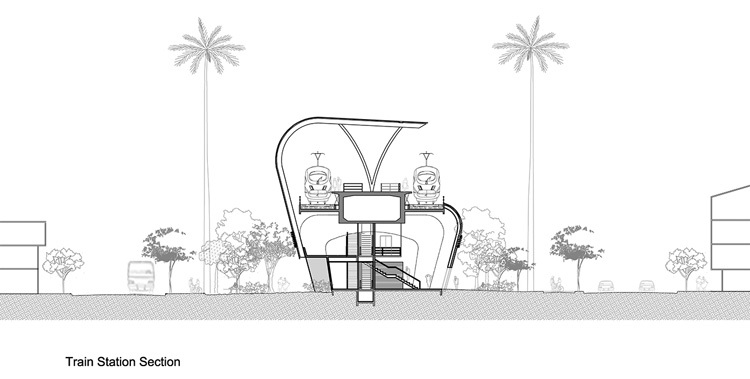 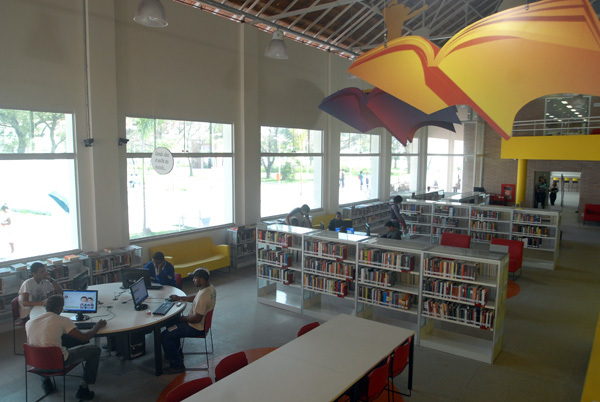 A configuração de uma nova imagem para o Complexo de Manguinhos, com a incorporação da poderosa Biblioteca-Parque, de uma escola profissionalizante de grande porte, do Centro de Geração de Trabalho e Renda, do Centro de Apoio Jurídico, do Centro de Referência da Juventude e de praças e espaços de convivência na escala de todo o Complexo, mostra a insubstituível função do poder público na reestruturação sócio-espacial da cidade. 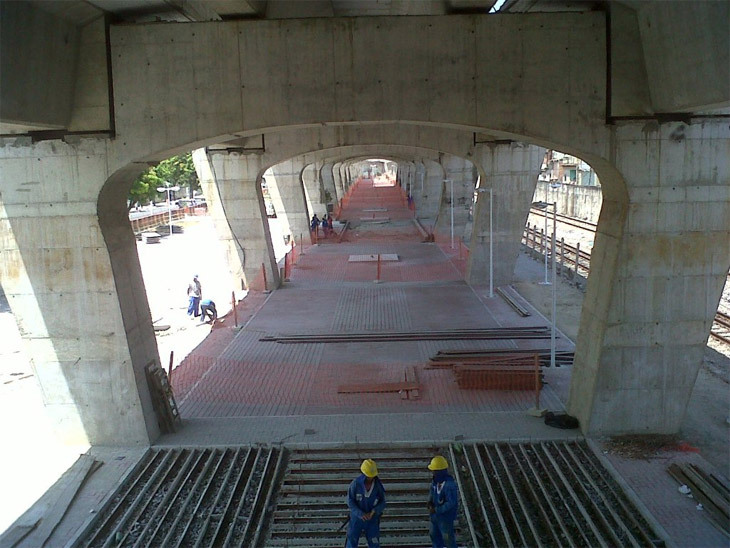 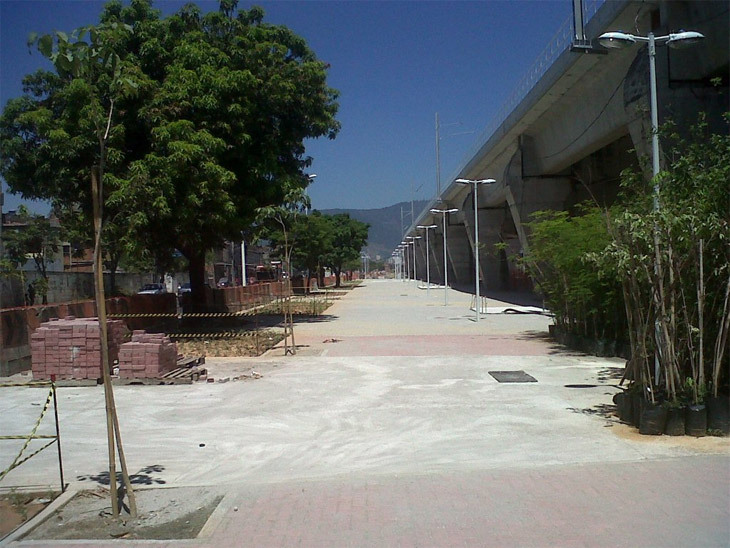 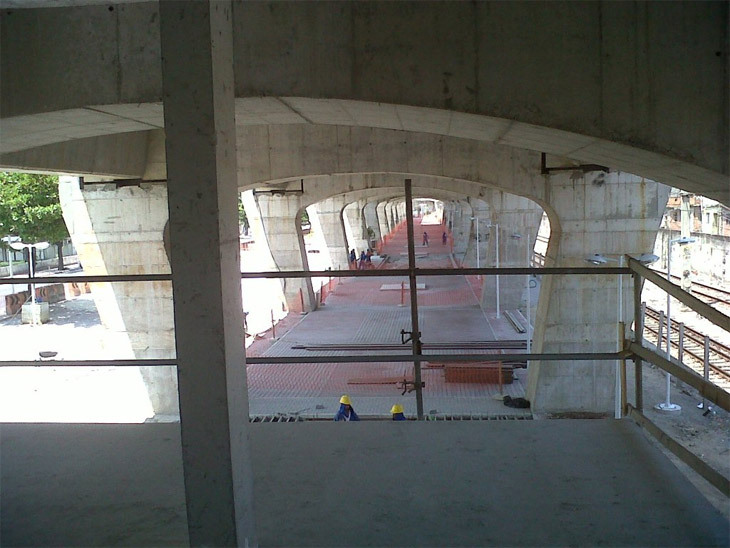 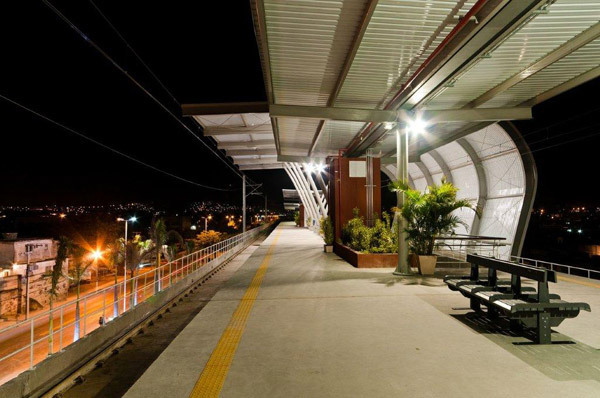 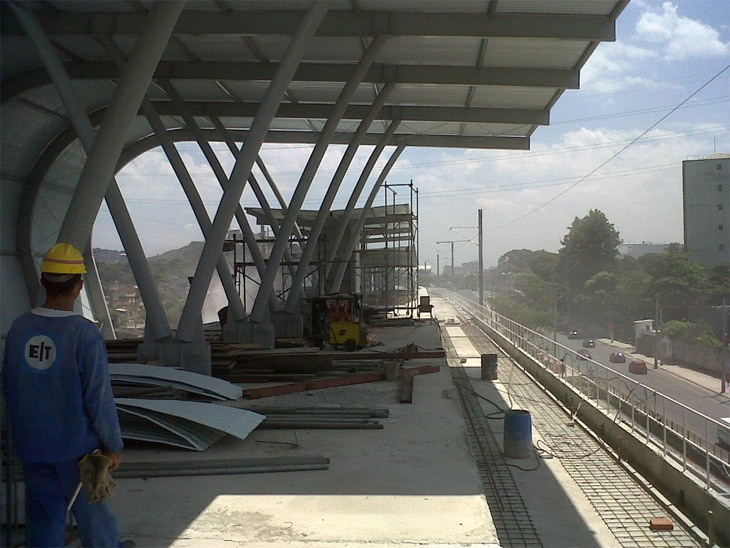 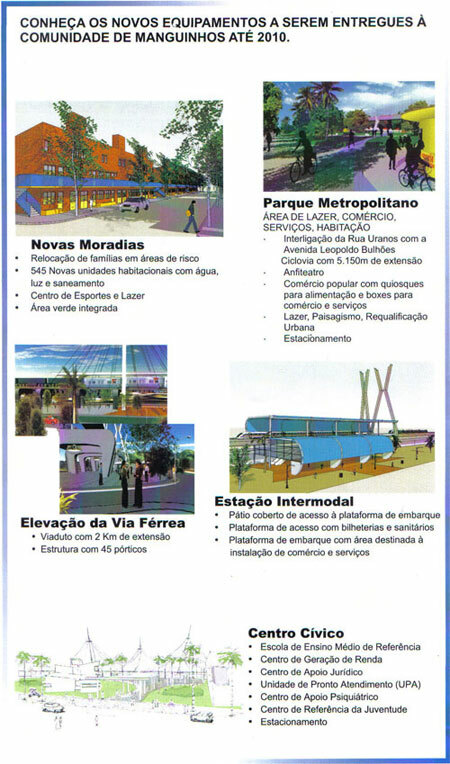 A Rambla projetada para unir o Centro Cívico com a nova estação de trem incorporada pelo projeto, constitui a nova e forte imagem do lugar na escala da cidade, e representa a materialização de um novo tipo de espaço público, conectivo, multifuncional e de qualidade estética, capaz de configurar contundentemente o legado social do Governo no plano urbano. 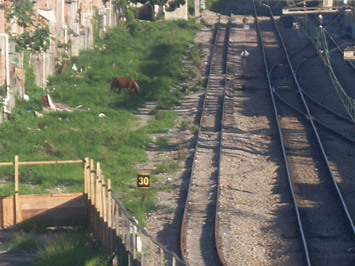 Usos existentes no local e no entorno: grandes estruturas viárias e ferroviárias, refinaria de petróleo, centro de investigação de saúde (Fiocruz), grandes depósitos de apoio da estrutura portuária da cidade, bairros populares, favelas. 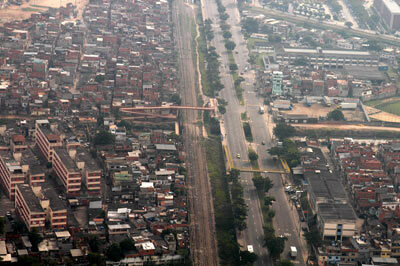 Rio de Janeiro’s Favelas (shantytowns) house 20% of the city’s population. 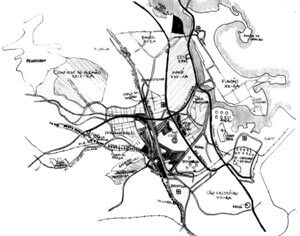 Approximately 1 million people in a city of 5,5 million, live in these unplanned communities that began to emerge over 100 years ago (*1). 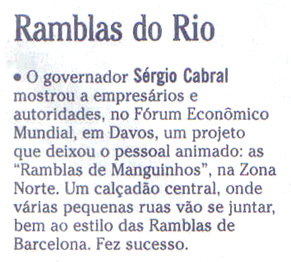 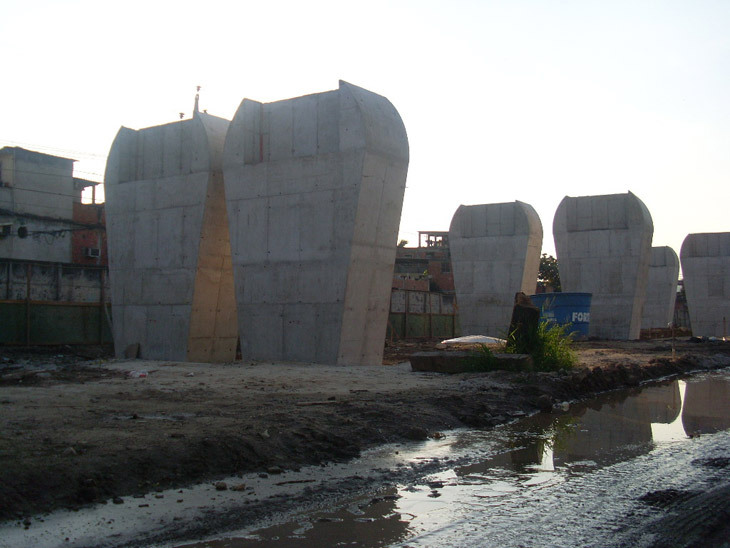 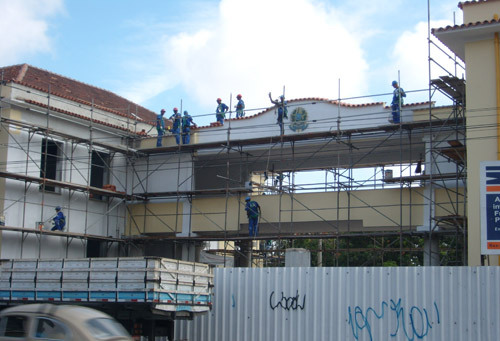 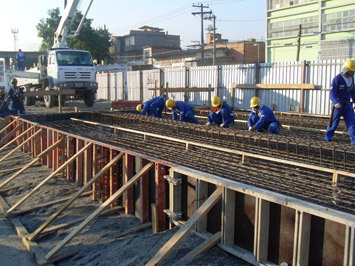 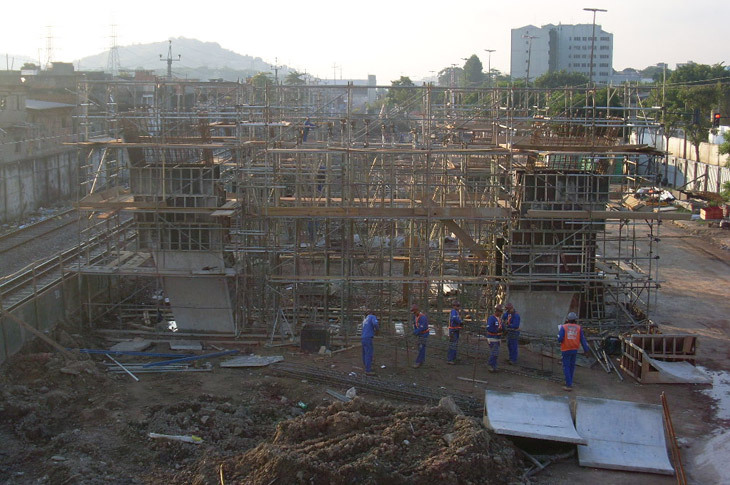 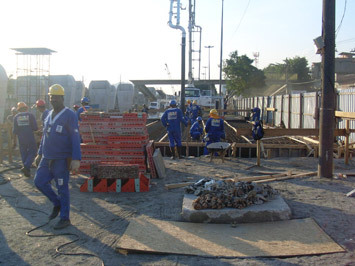 The framework of the development of these urban scale projects, called the Favela-Bairro Program, is a city-run project. 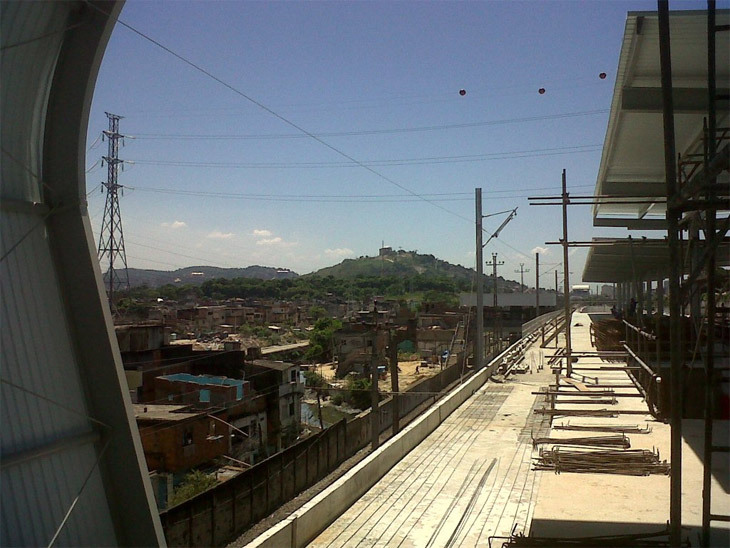 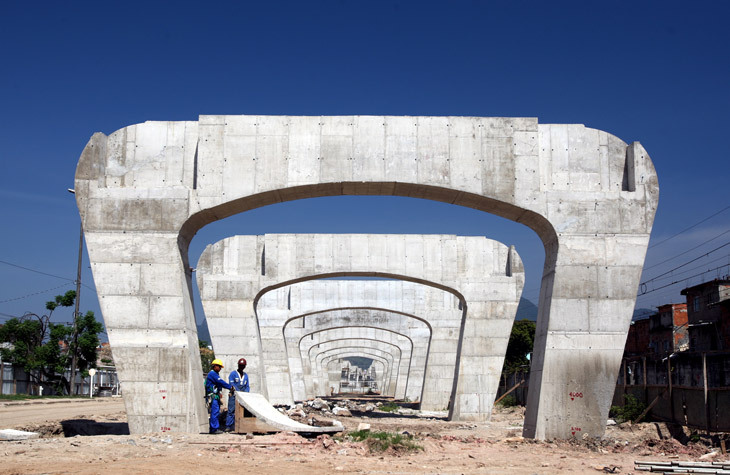 The program's goal is to integrate the favelas with the rest of the city by introducing infrastructure (roads and footpaths) and facilitating services, such as water, power, communications and new buildings functioning as new landmarks. 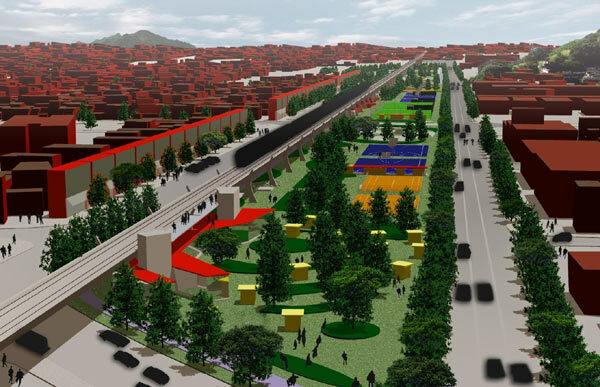 The team’s approach focuses on the favelas' existing potential, rather than starting a new layout from scratch, by introducing elements such as plazas for public gathering, community centers, new buildings for social interaction, healthcare centers, parks and olympic village. 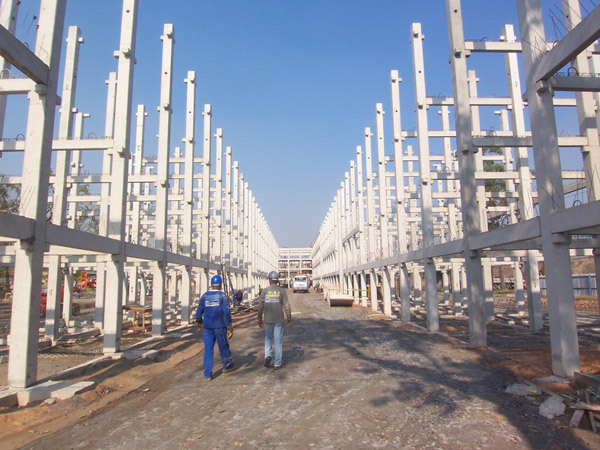 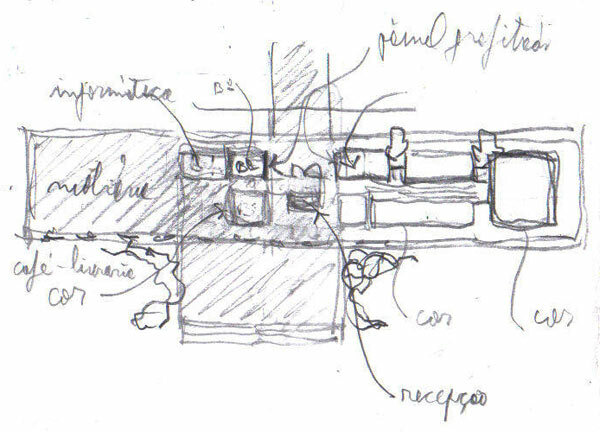 We believe that the design process (which includes extensive meetings with residents and consultations with experts from various fields) could be translated to different types of projects. 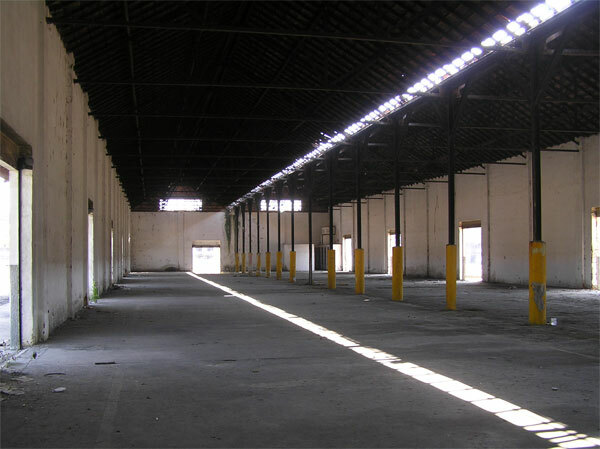 "Public space today is the number-one factor of urban regeneration". 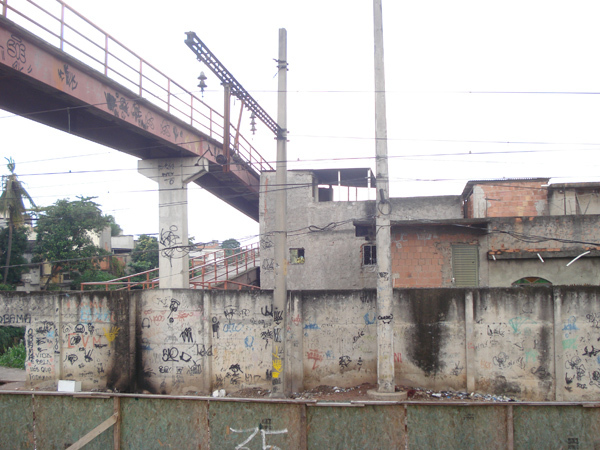 The problematic urban issues (*2) in Rio de Janeiro are intimately related with socio-cultural and citizen security aspects. 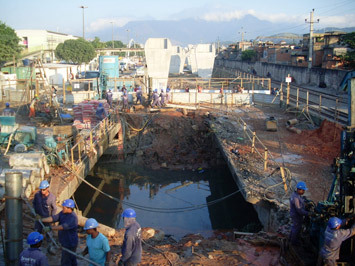 Brazilian social commentator, Zuenir Ventura describes the ever-present contradictions of Rio as symptoms of a "broken city", as distinct from the "marvelous city" of tourist publicity and (often self-generated) popular myth. 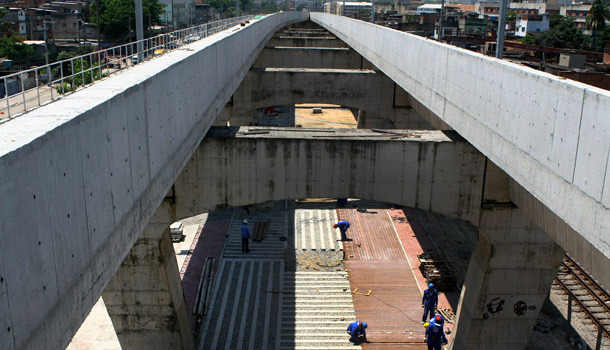 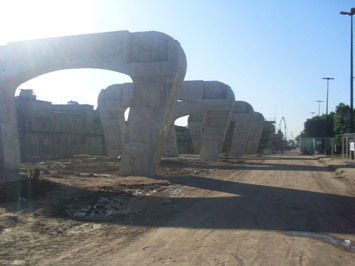 Given this context, urban design projects need to simultaneously consider physical aspects (infrastructural, urban and environmental), social conditions (that include the cultural, economical and existential aspects), ecological issues (that imply mental, social and environmental questions (*3)) and the security of the citizens that is related to the control of the social territory. 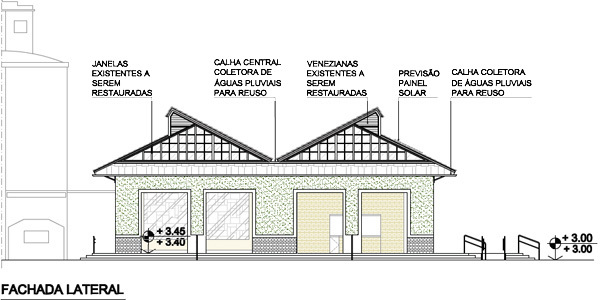 All these variables intersect in an interdisciplinary work effort, made in dialogue with the public power (the municipality of Rio de Janeiro), the community representatives, the architects and professionals from various fields. 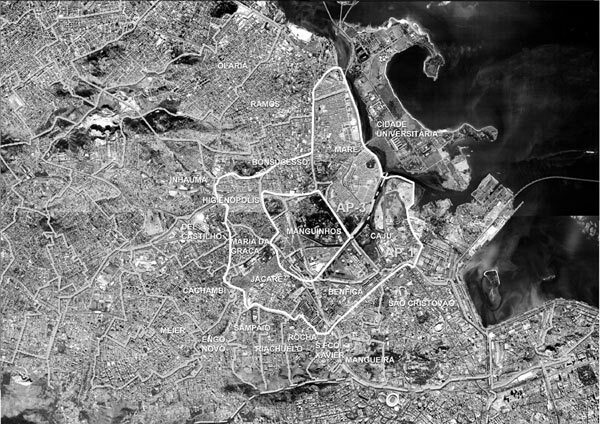 (*1) The city is defined by its contrasts; it always wants to explode and does not support barren rules…an unforgettable city is an immense conglomerate of images. 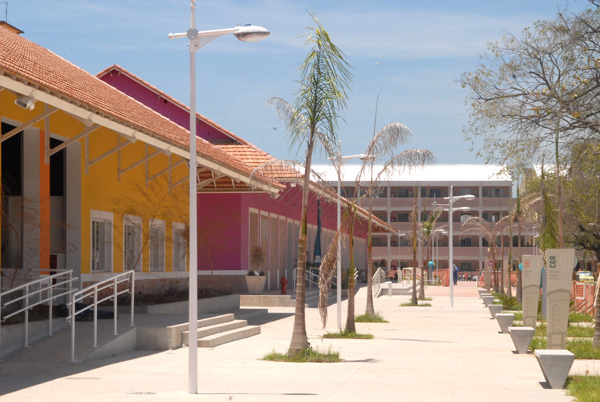 (*2) …today it is necessary to make the Therapeutic Policy, which implies to consider the conditions of the coexistence; it is necessary to learn how to coexist, and in that sense, the favela teaches us. 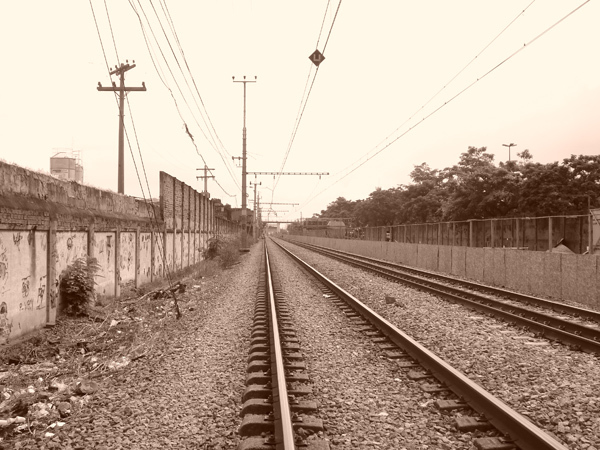 (*3) Freud reminds us of the fact that misery should not only be approached to the economic way and the quantities, rather the “neurotic misery” should make us attentive of interdependence between mental life and physical life, meaning that this is the question to which we architects should “listen to”. 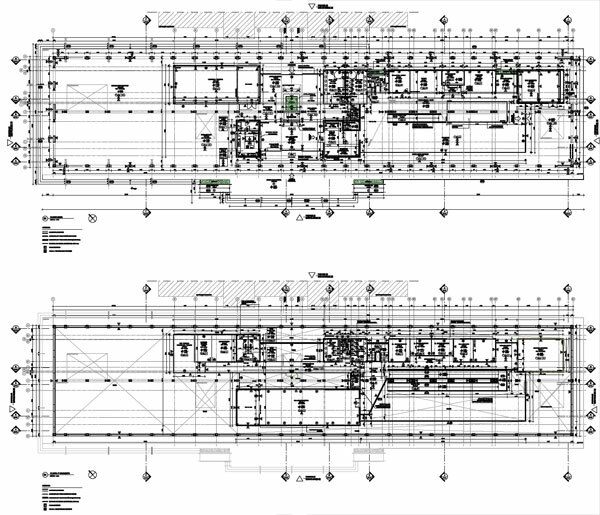 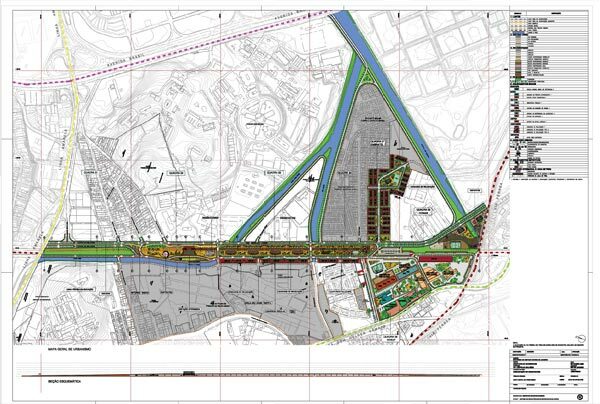 The work is lead by an interdisciplinary team throughout the process, with the general coordination conducted by the architect-urban designer. 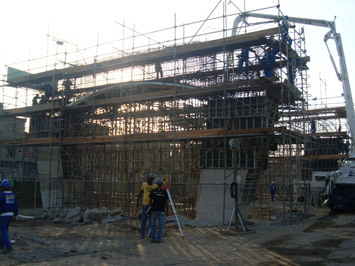 The disciplines involved include: civil, structural, transportation and environmental engineering, sociology, legislation, cultural and communication consulting. 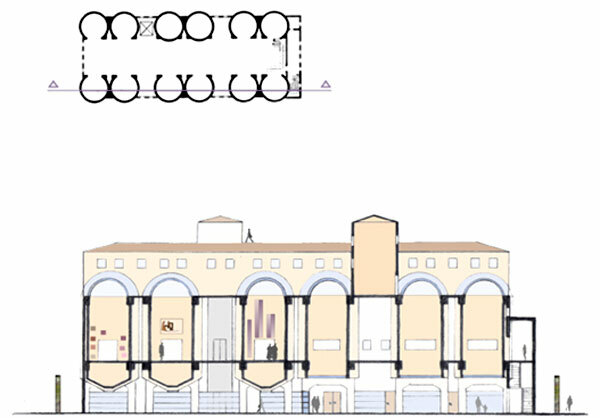 A- After several visits to the site, the elaboration of the scheme of reading of the structure of the place, which consists of a topological study of the most relevant characteristics that reveals the singularity of the place. 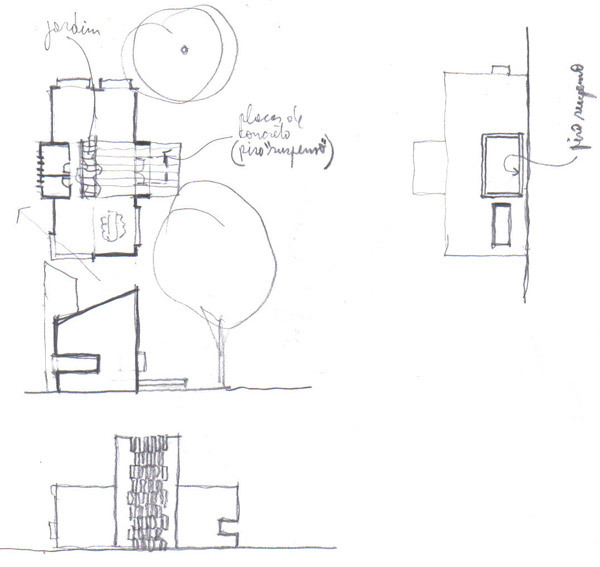 The conclusions of this phase determine the elaboration of a synthesis scheme. 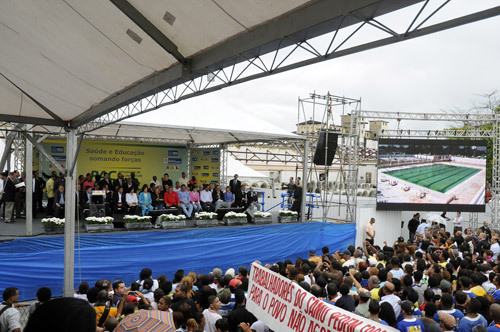 B- The listening of the demands. 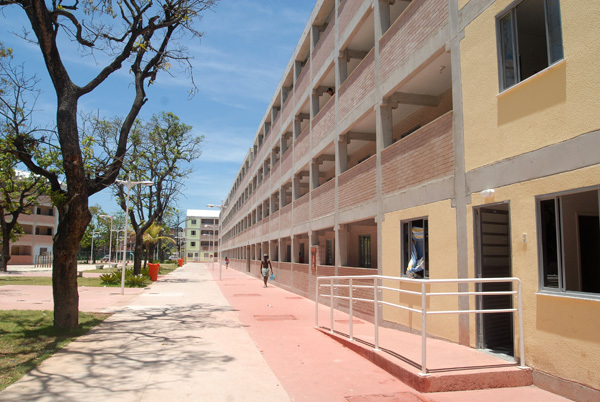 This phase consists of the meticulous listening of both the latent and declared demands of the residents of the area of intervention and its surroundings in public hearings and meetings. 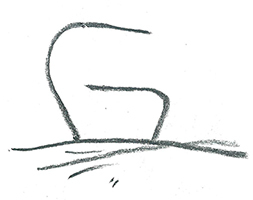 The listening implies the use of the Freudian method of free associations and fluctuant attention. 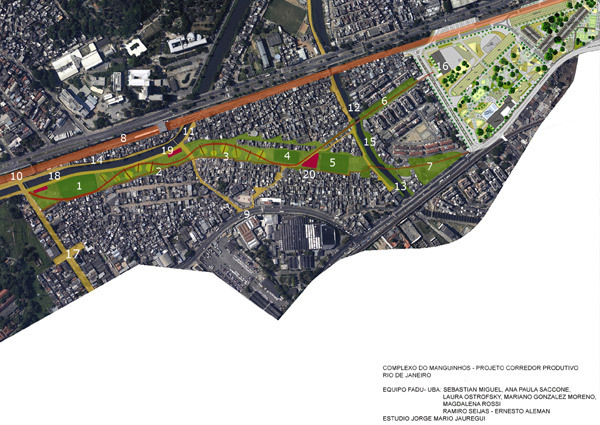 This question is very important in that it doesn’t mean to respond directly to those demands but rather to interpret them, to articulate them with the inherent logics of the place and with the interests of the city as a whole. 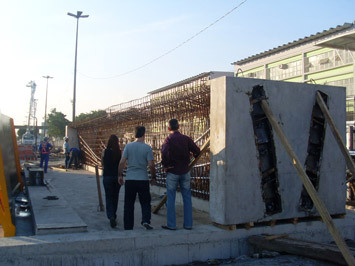 Throughout the process (design to execution of the works) the interaction with the community not only grows but evolves. 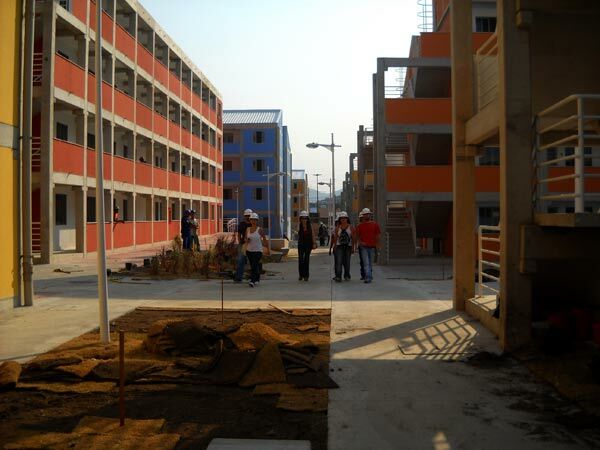 Firstly the participation is characterized as an interlocution that allows to define the program. 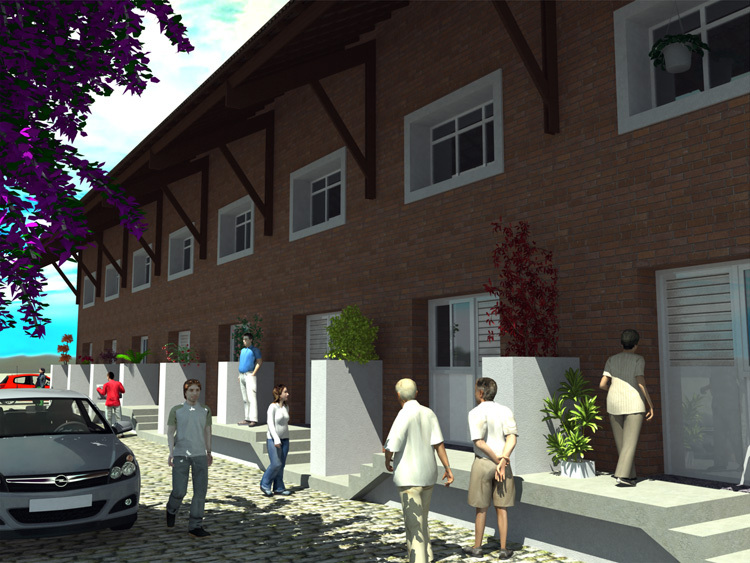 Secondly, with the development of the project the resident’s involvement becomes deeper and more specific, to the point of having the community to follow up the execution of the works. 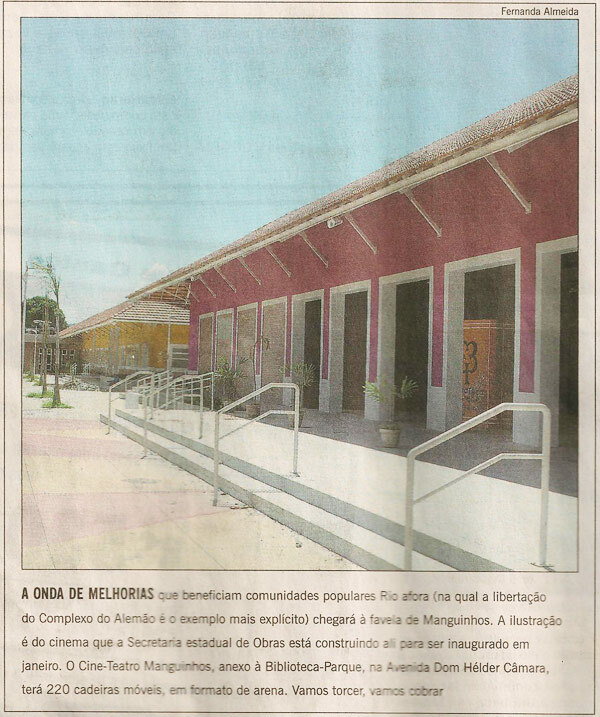 Finally, members of the community integrate the staff of the so-called POUSO (Center of urbanistic and social orientation), which is typically a small structure that the municipality includes in the scope of the works with the intention of monitoring the results of the intervention and as a post for future assistance. 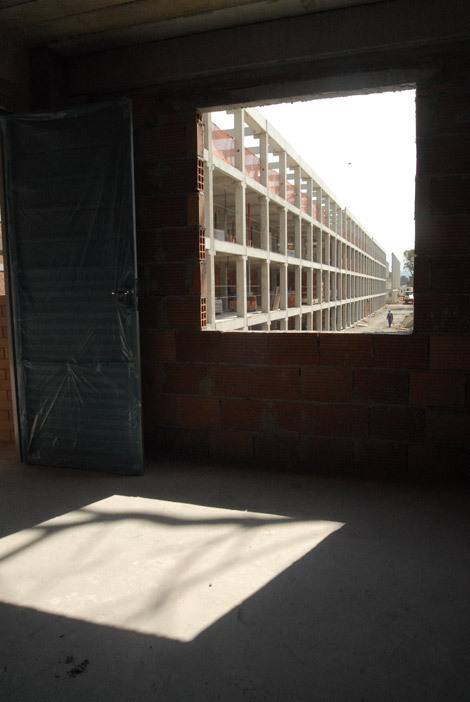 C- The elaboration of the urban parti, which consolidates the material produced in the first two phases and establishes the design criteria for the intervention. 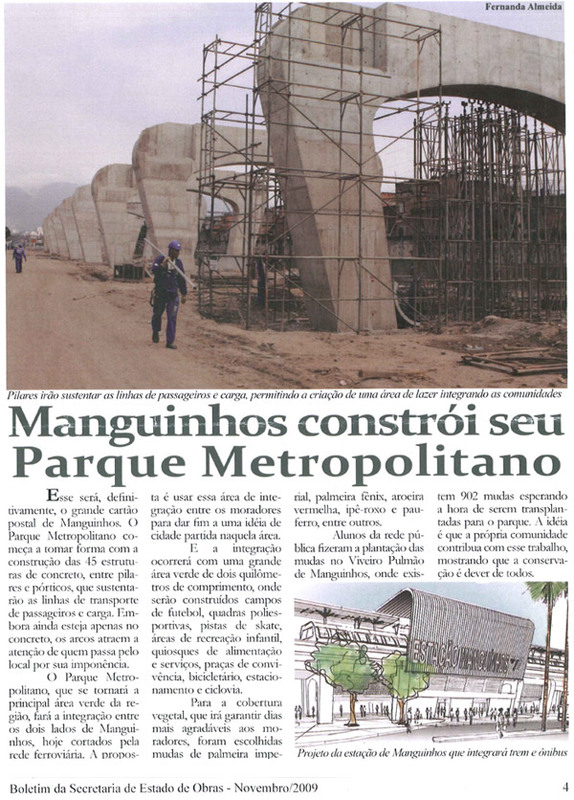 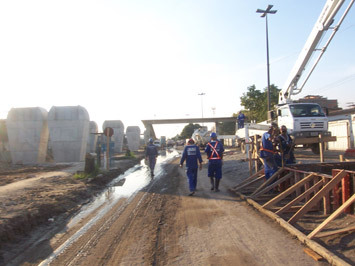 This project for the elaboration of a Plan for Urban and Social Development for the region of Manguinhos emerged from the demands of the government of the city of Rio de Janeiro. 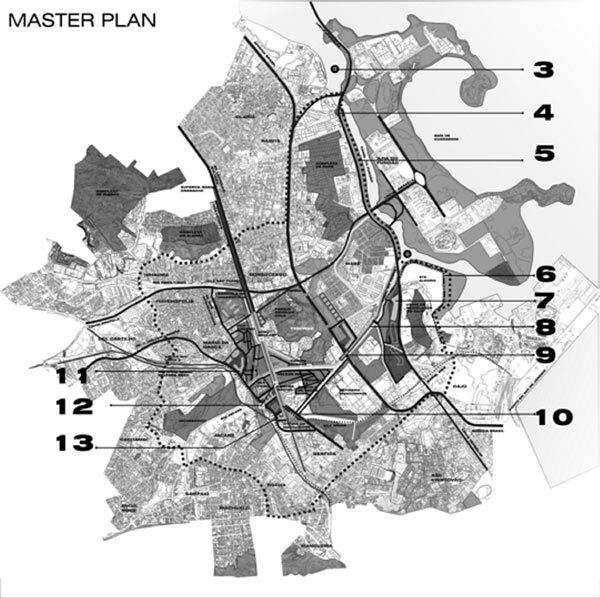 The city, through public consultation, called for methodological urban proposals to be applied in the lapse of twenty years, phased in periods of four years. 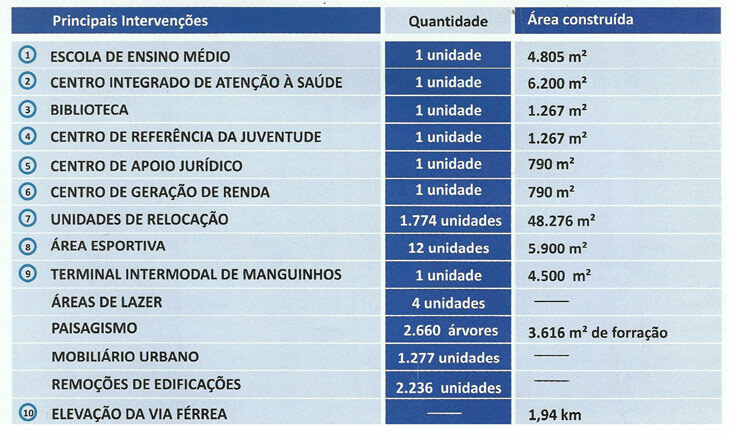 Area comprises 1,400 hectares of territory with a nucleus of ten informal communities (favelas) with a population of 28.000 inhabitants (400 hectares). 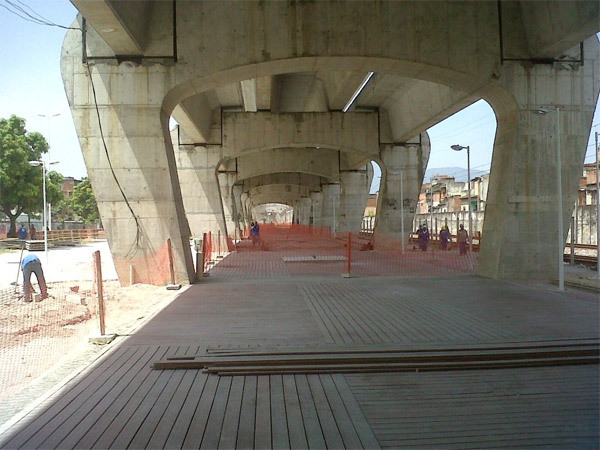 It is located in one of the accesses to the city of Rio de Janeiro from the North side in the intersection of an expressway, main avenues, a river and a railway line. 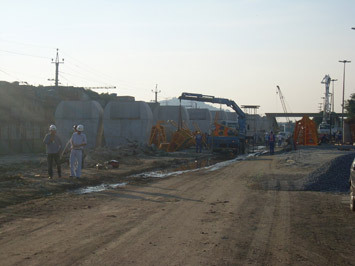 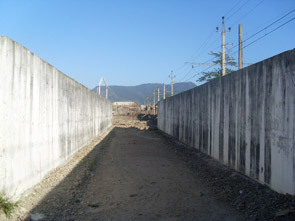 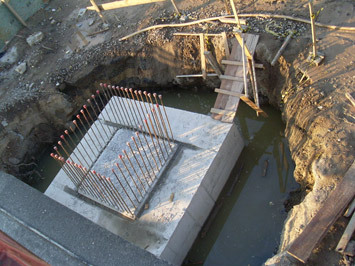 The Railway line performs as a barrier dividing the area in disconnected fragments. 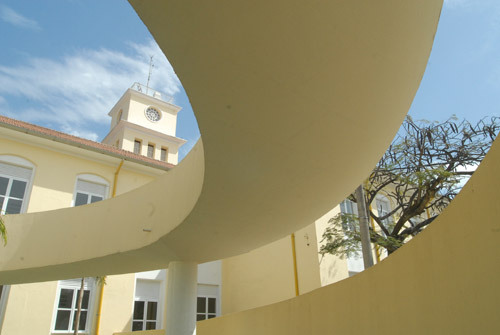 The complex’s land use pattern combines industrial, educational and research institutions (the campus of the Federal University and the Fiocruz Reseach Institute) commercial areas and a portion of the Port area of the city, all mixed with informal residential occupation. 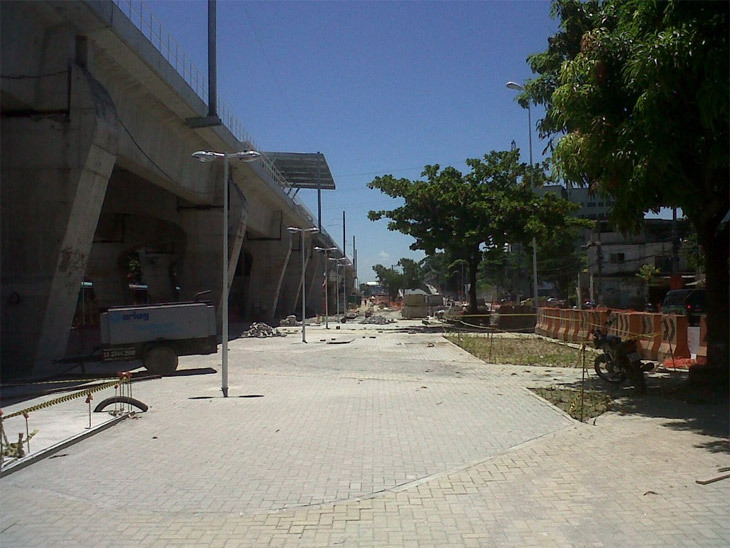 Given the high levels of violence and crime resultant from drug trafficking, gang territorial disputes combined with police action, the area is locally known as the Gaza Strip and one of its main arteries (Leopoldo Bulhões avenue) as the Death’s Avenue. 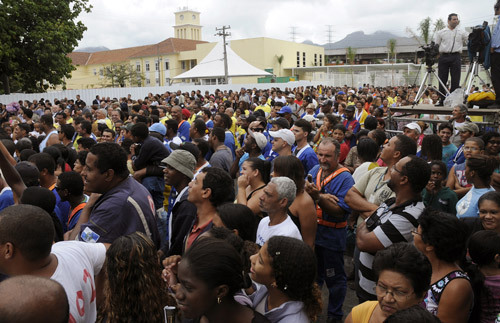 These facts, far from being anecdotal, they account for the scale of the social problems, which are more severe than the physical-territorial issues. 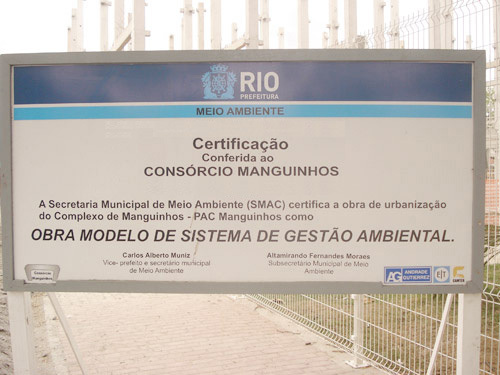 The main challenge was to re-structure the area that is stigmatized and environmentally degraded, providing the municipality with a feasible implementation plan, organized in phases according to the governance calendar (municipal authorities are elected every four years). 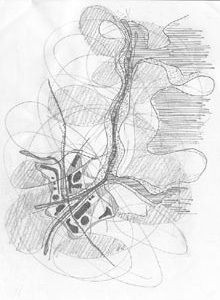 The first step for the elaboration of the Plan for Urban and Social Development consisted of the definition of the boundaries of the area of intervention, analyzing and responding to its complex geographical (convergence of river, expressway, railway line), topographical (treatment of edges of rivers and channels, floorings, landfills) and social aspects as the patterns of the use of spaces and the established social practices (in both the informal and formal areas). 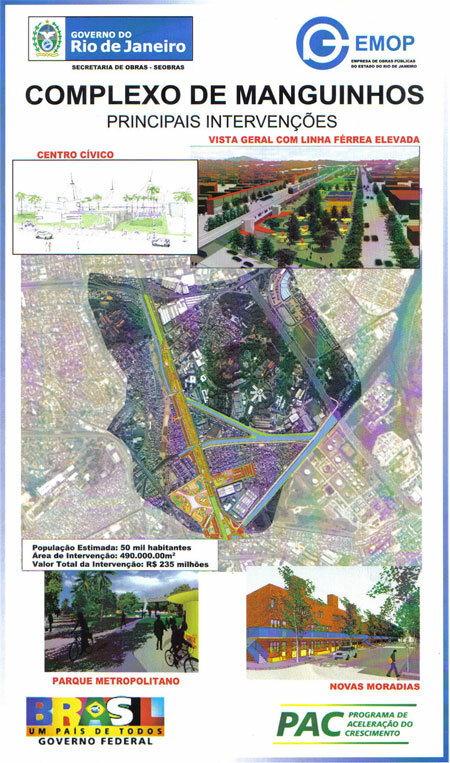 The team defined criteria for the inclusion of the adjacent neighborhoods addressing accessibility, infrastructure and the reorganization of the centralities. 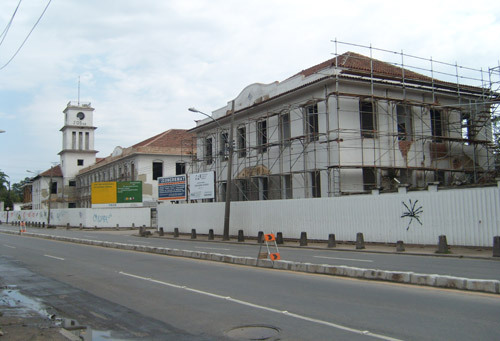 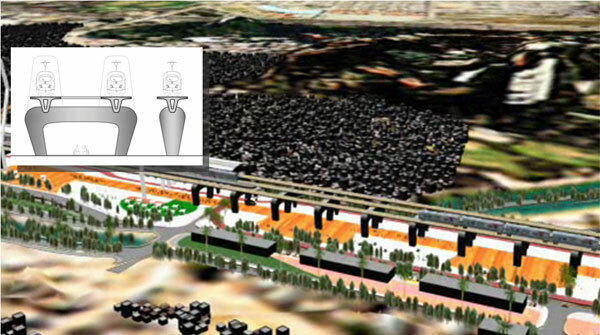 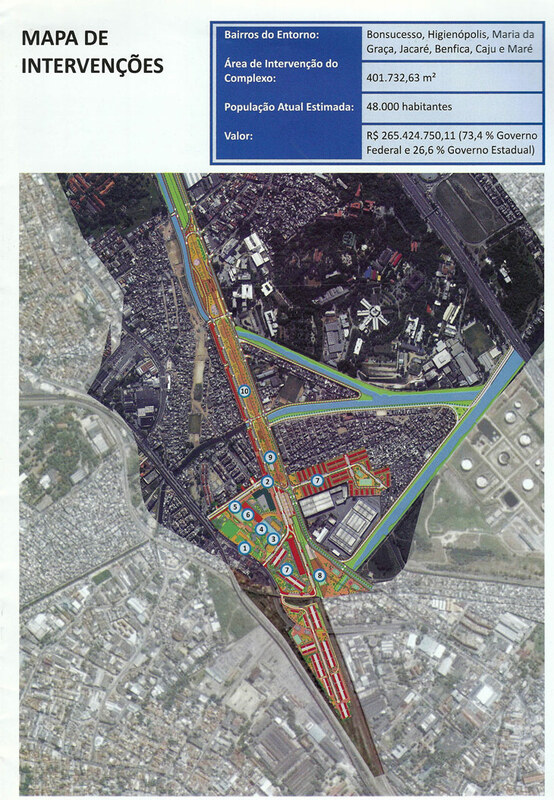 In addition to the overall development plan, we have developed a proposal for one sector in particular as an exemplary case selecting Leopoldo Bulhões avenue, the most conflictive sector, where the railroad was drastically dividing the area. 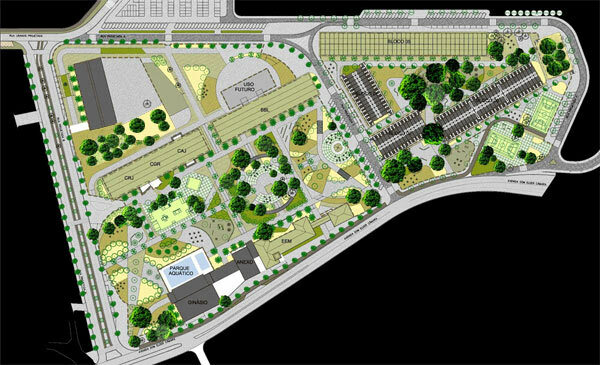 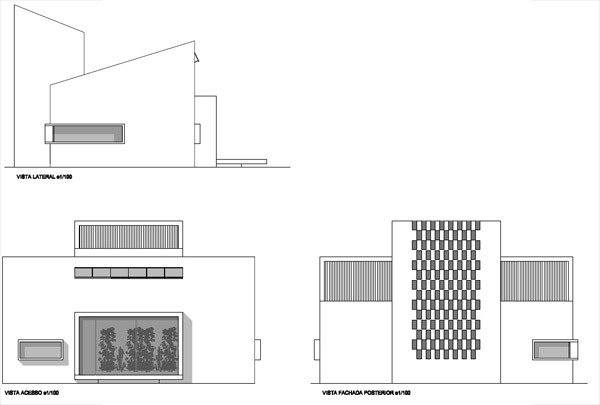 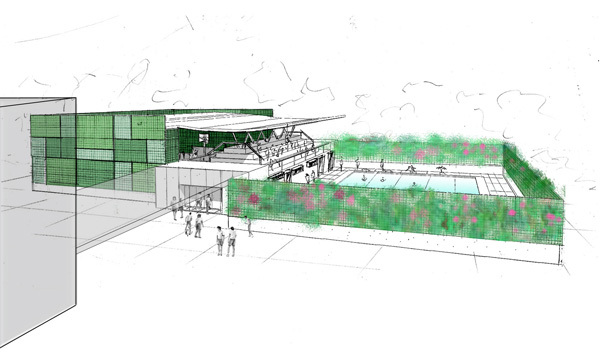 The project consists of a new landscape design of environmental quality, defined by the conjugation of spaces, activities, buildings and vegetation. 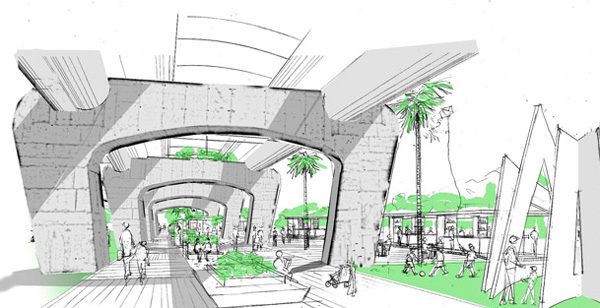 This linear public space is thought as a connector of the residential informal sectors, currently divided by the railway line, which we proposed to elevate. 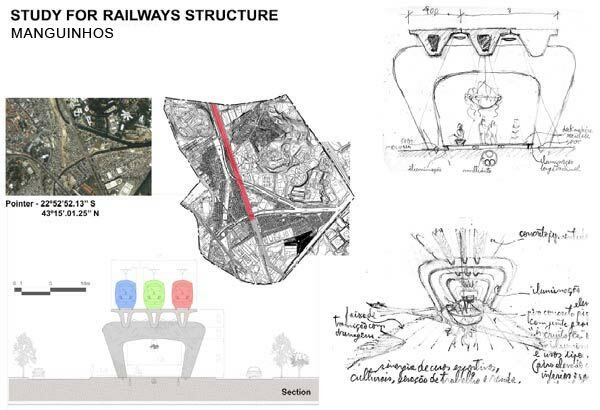 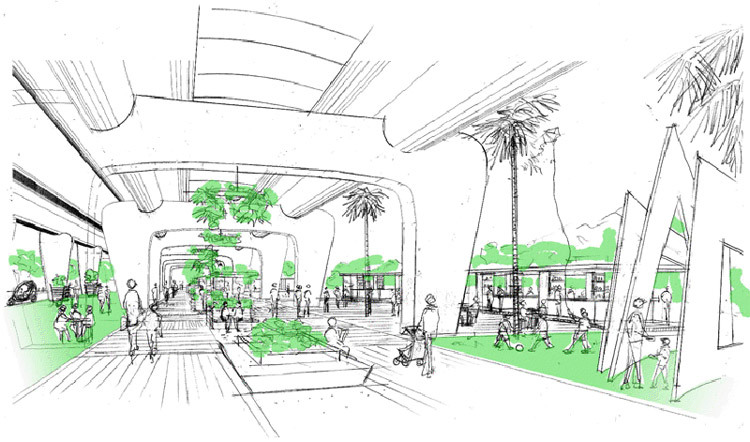 The main element of the proposal is the public walkway itself, the constitution of an urban street wall (façade) along the avenue and a new multi modal transportation interchanger (train, bus, taxis, moto-taxis, vans, bicycles) open 24 hours. 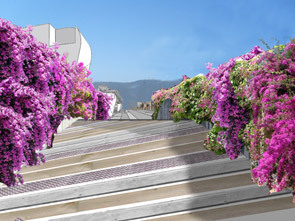 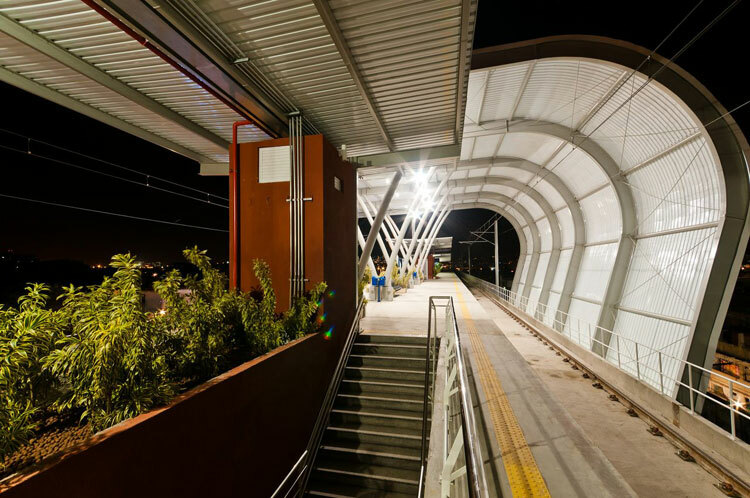 This combination of interrelated elements allowed for an integrated public space eliminating existing barriers and transforming the most problematic sector in the area into one of greater virtues: from divider, to connector. 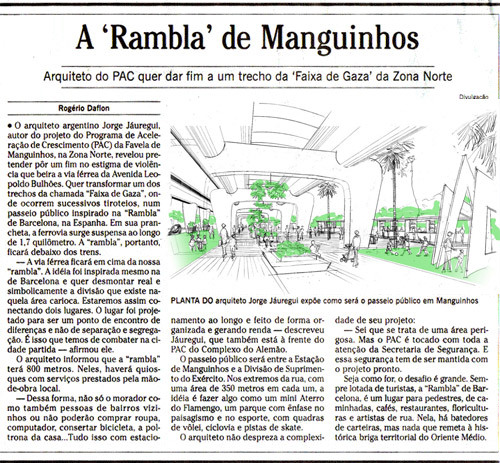 The premises for the landscape design took as reference the Flamengo Park, in the city of Rio de Janeiro by Roberto Burle Marx, which was conceived as a place of relaxation, sport and culture with the values of a modern democratic space. 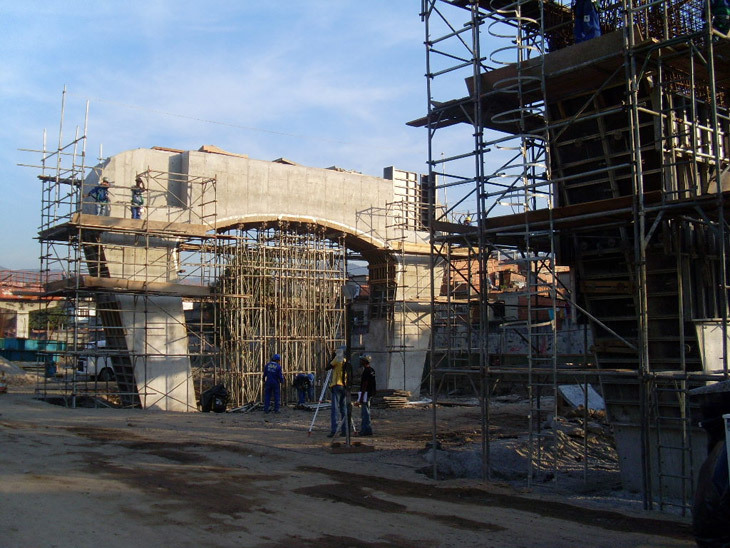 The structuring programs of the project were carefully defined to satisfy the different age ranges of public including sport, culture and job and income generation facilities. 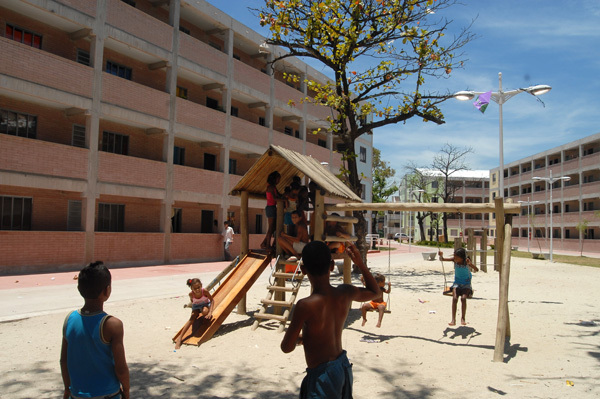 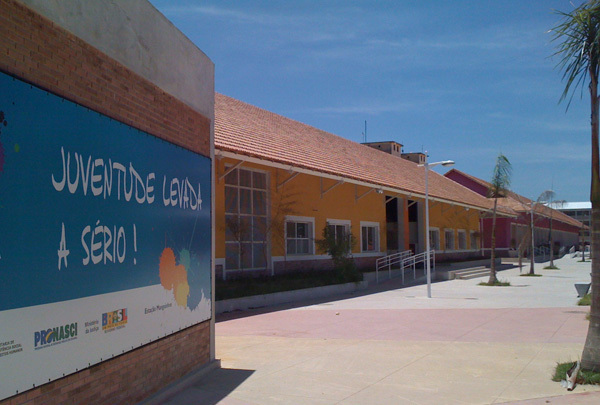 However, within this framework, an emphasis was made in providing children and teenagers with alternative attractions that would integrate them to the community and prevent them from being seduced by the drug dealing activity, which is typically a key job generator in the economy of the low-income areas of the city. 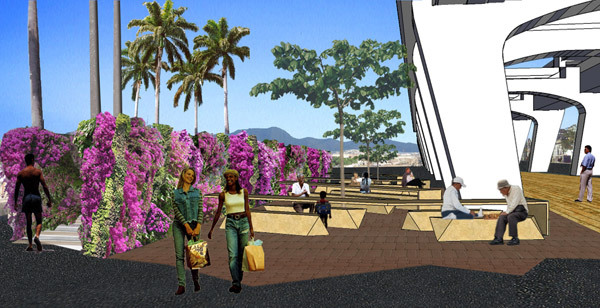 The project promotes a type of public space that performs as a social articulator, attracting the favela residents as well as a larger public from its surroundings. 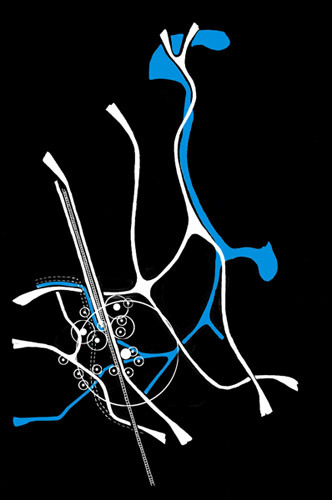 · To produce cohesion articulating heterogeneous logics, stitching the city without flattening it in homogeneity, searching for the coexistence of the city of fluxes with the city of places. 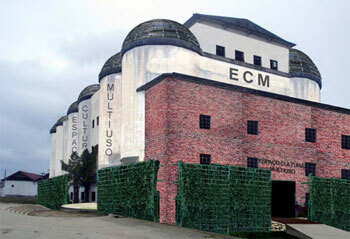 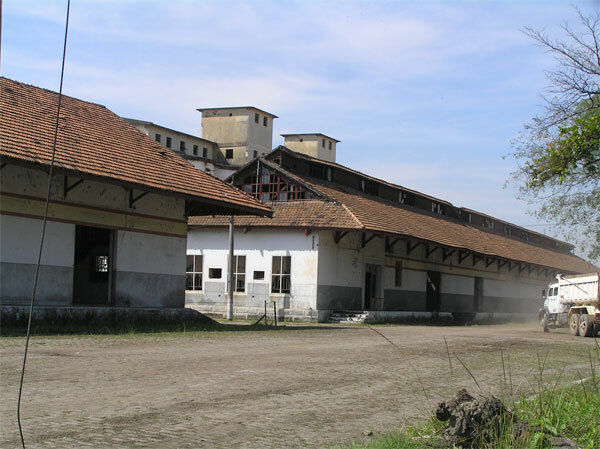 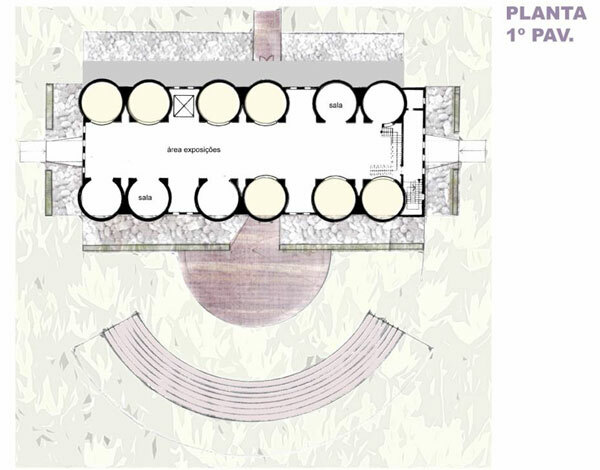 This kind of projects provide the historical opportunity to act and think with new parameters that precisely privilege the quality of public life, proposing new relationships with the environment, where the public facilities have a central function in rearticulating the coexistence among differences. 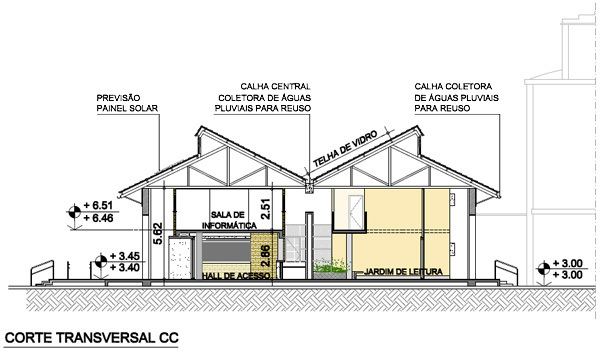 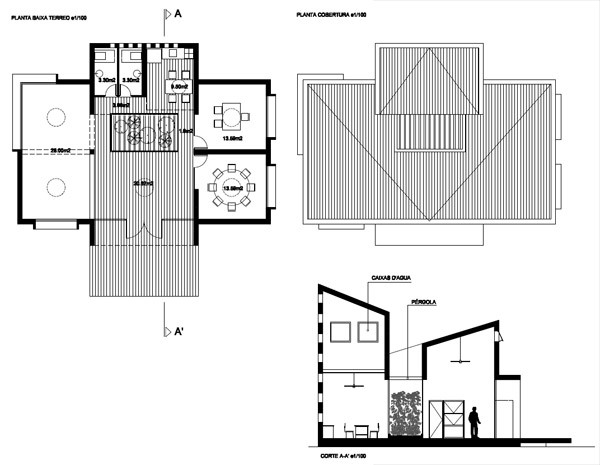 Jorge Mario Jauregui is an Architect-Urban Designer based in Rio de Janeiro, working with public and private clients in projects of public interest, in both the “formal” and the “informal” areas of the city. 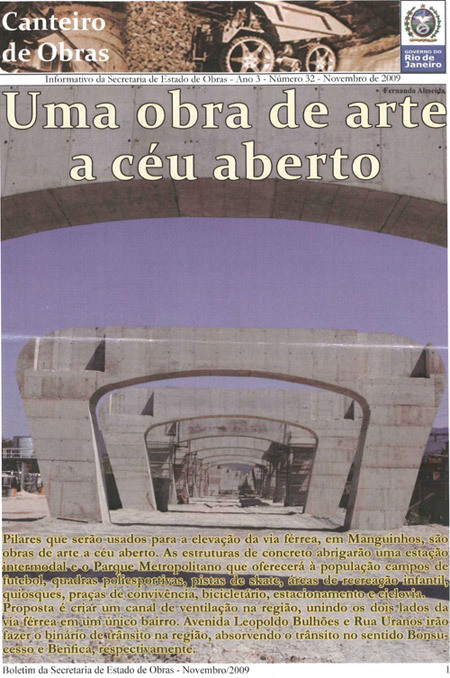 As a consequence his professional practice, has developed a critical-theoretical thinking in relation to the basis of architectural and urban contemporary issues that has been regularly published in specialized media. 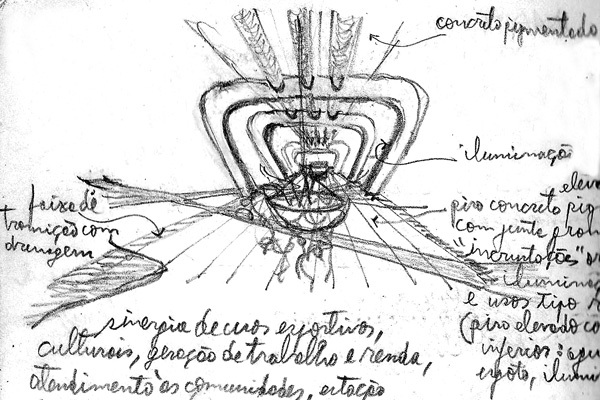 He is also coordinator of the Architectural and Urban Studies Center of Rio de Janeiro, associate researcher with the Laboratory of Morphology SICyT-FADU/UBA Buenos Aires and a member of the "Art and Psychoanalysis Cartel” of the psychoanalitic Letra Freudiana institution, in Rio. 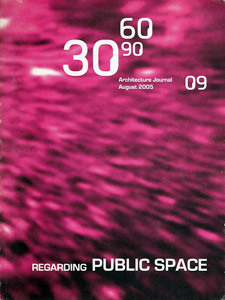 Jauregui was the recipient of the Veronica Rudge Green Prize in Urban Design, from Harvard University, GSD in 2000.
distributed by Princeton Architectural Press. 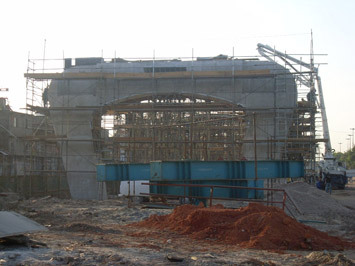 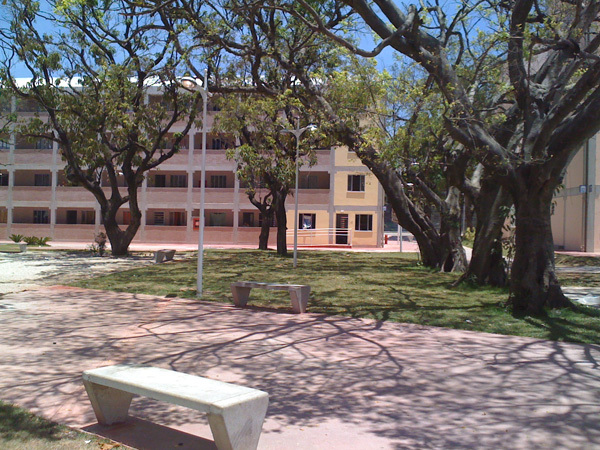 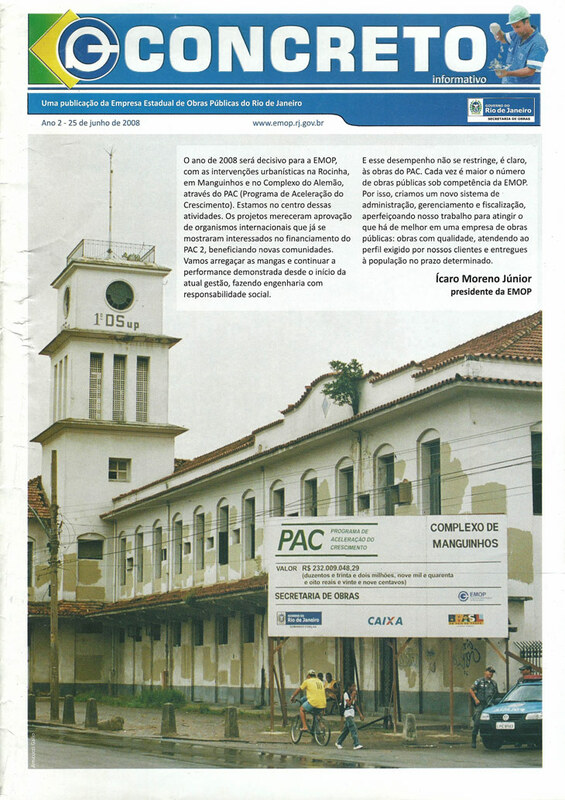 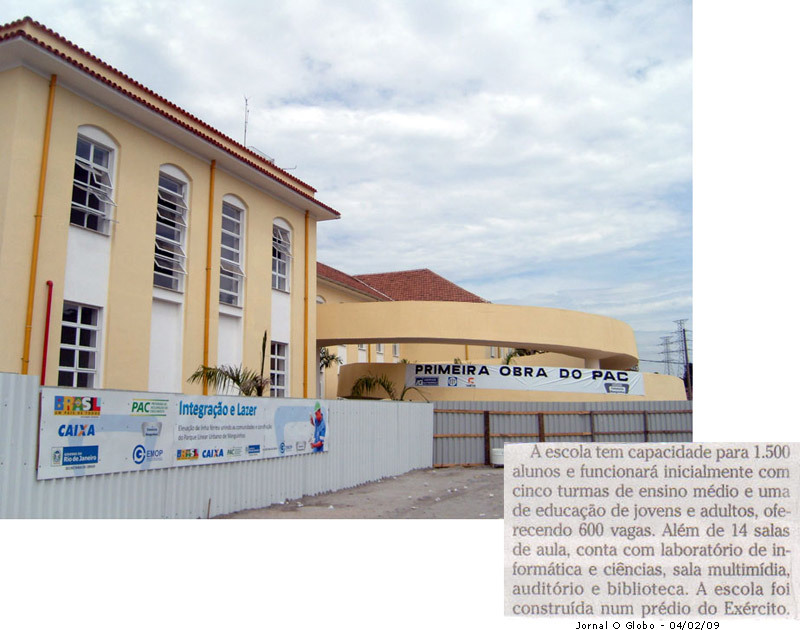 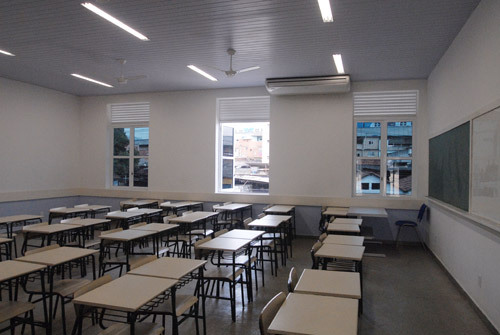 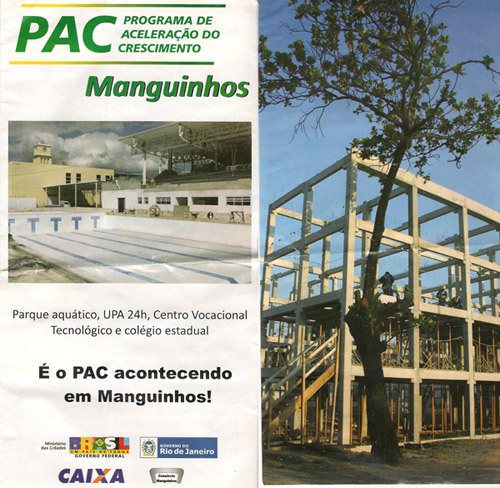 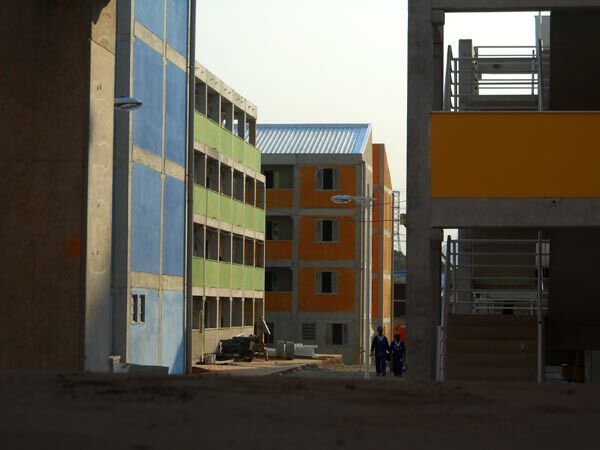 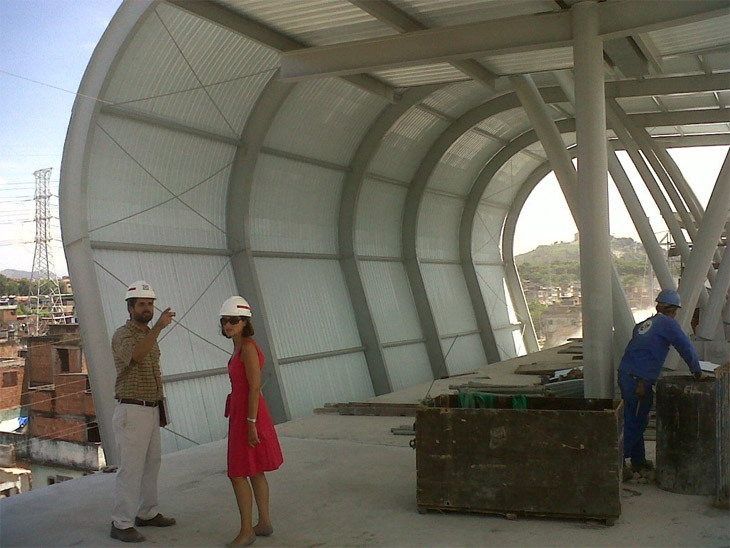 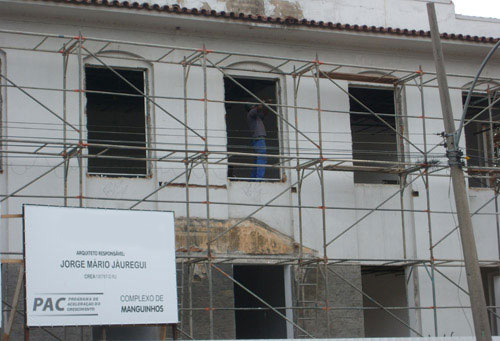 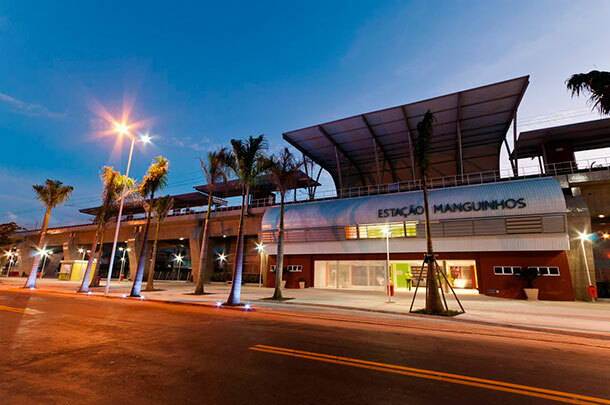 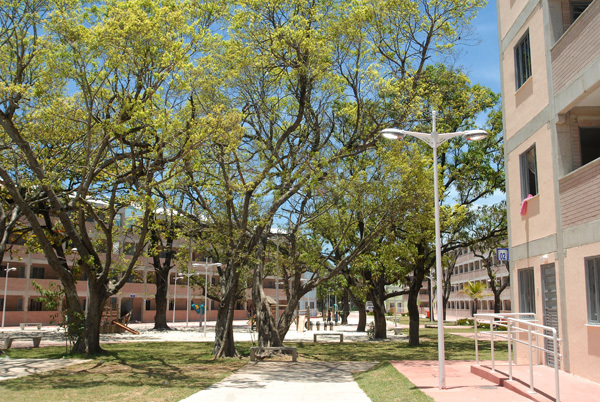 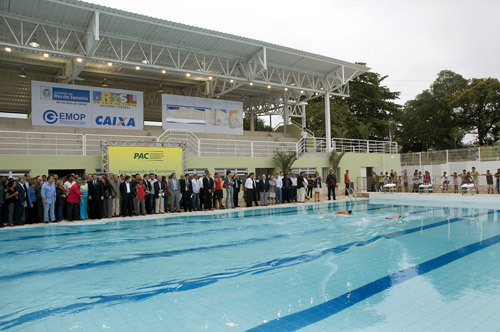 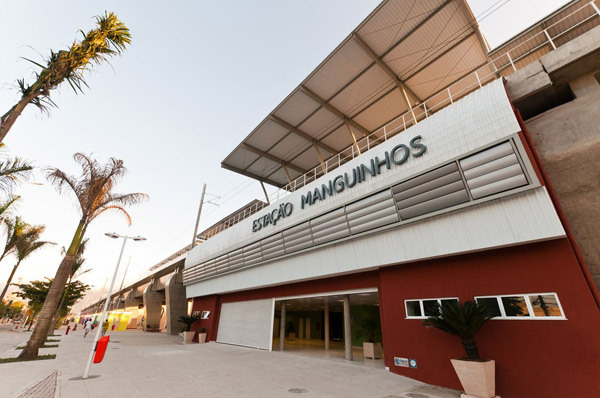 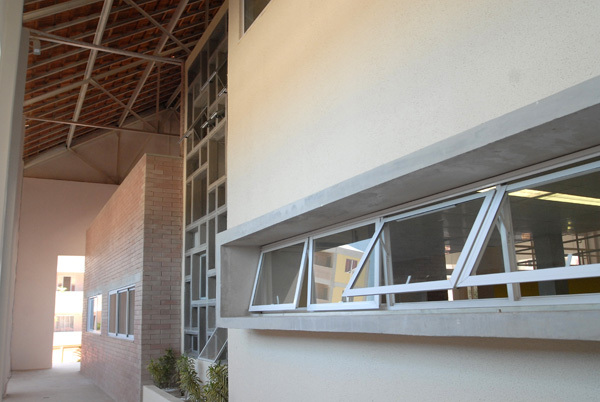 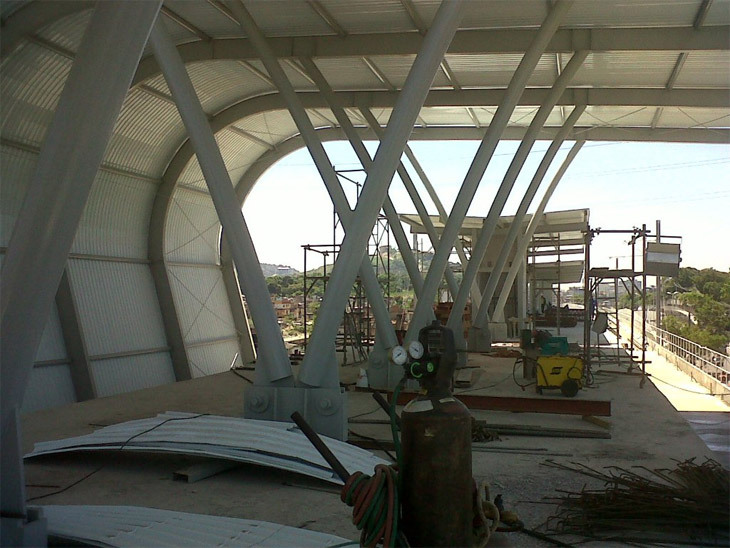 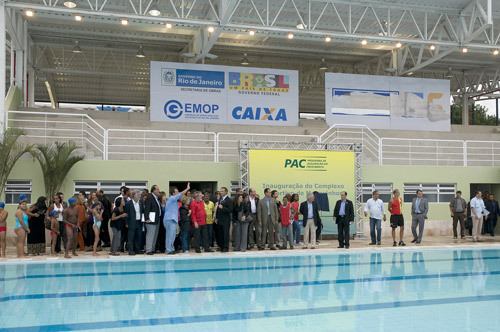 Projects conceived under the principles of "sustainable building"
The new Manguinhos High School, elaborated for the Urban PAC (Federal Government´s Development Acceleration Program), was the first building inaugurated. 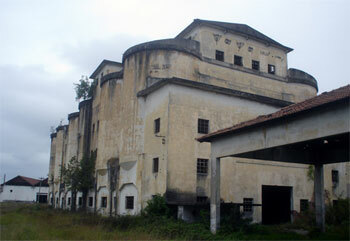 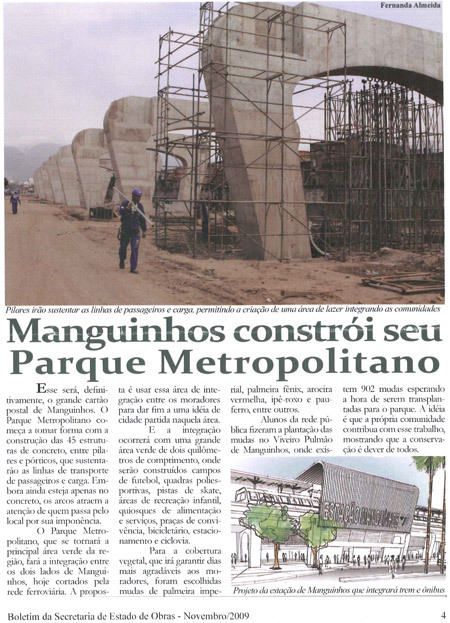 It is part of a large social and urban planning to “Complexo de Manguinhos” – a deteriorated suburban area in Rio de Janeiro – and was designed to occupy an old Army building, which area will form a Civic Center to the dwellers and visitors. 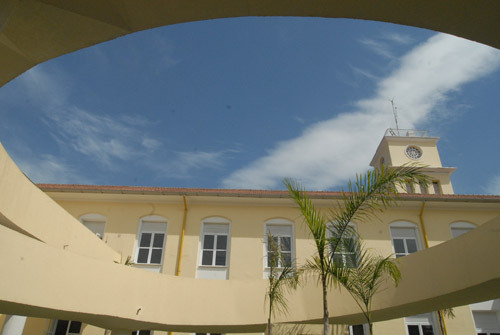 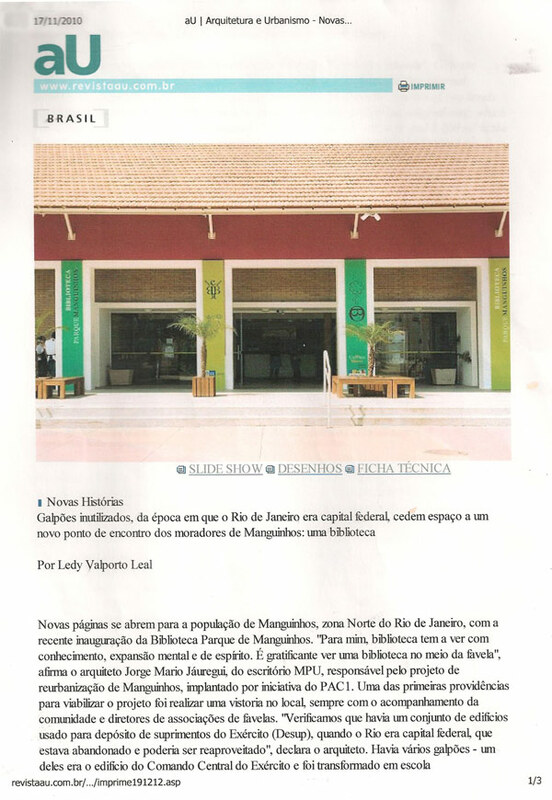 The school was named Luis Carlos da Vila, paying tribute to a known popular brazilian musician recently died. 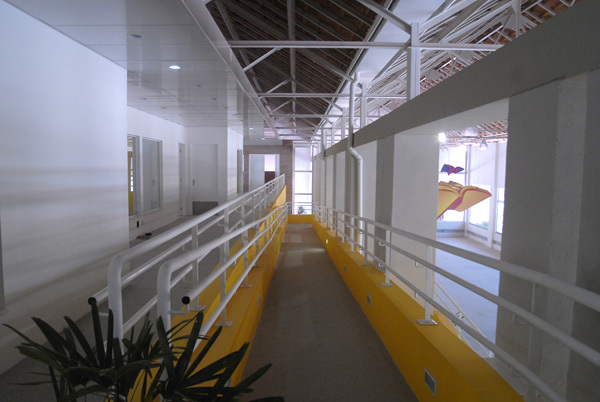 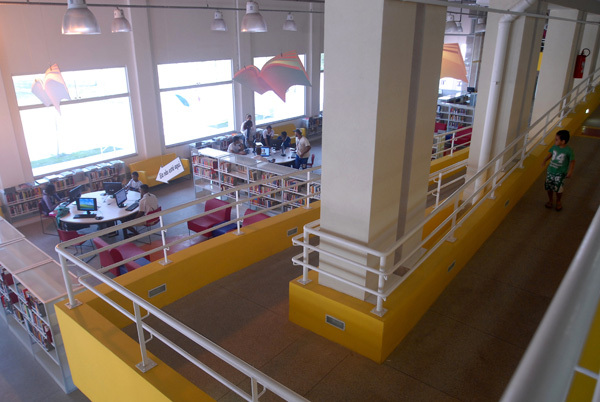 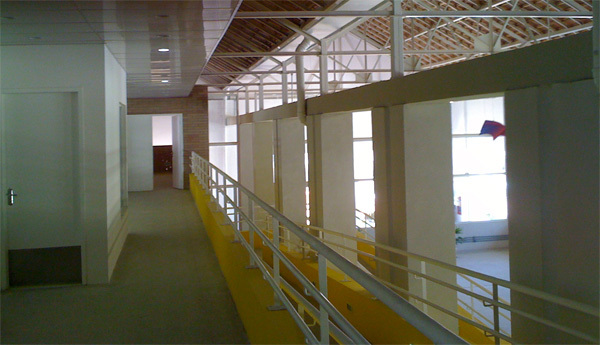 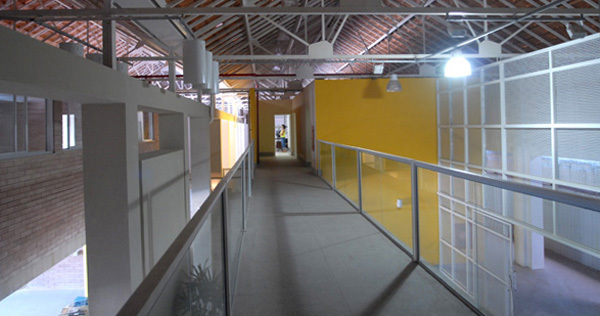 Its total area performs 4.500m², including a new building under construction, and was characterized by a complete intervention on the roof, rearranging all the internal spaces, changing all the windows and doors though keeping their original dimensions, and restoring the façades with new colors in white and yellow to emphasize all its decorative details. 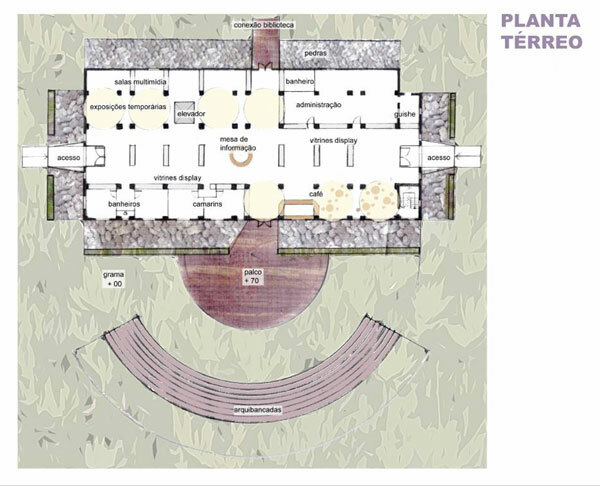 The building contains bathrooms for disabled people and their accessibility is guaranteed at all entrances and floors through a majestic ramp, joining the old and new styles, and is turned toward the Civic Center beautiful and inviting gardens. 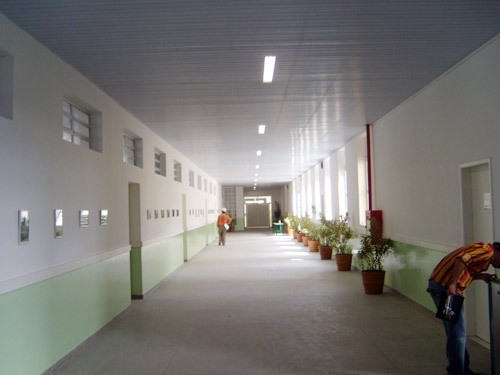 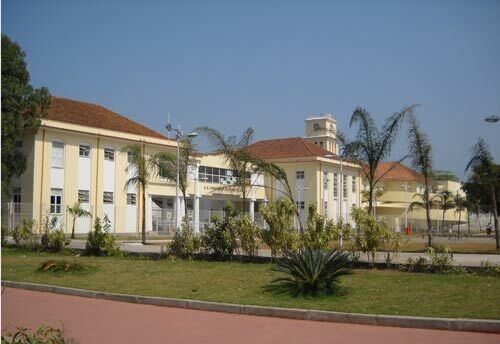 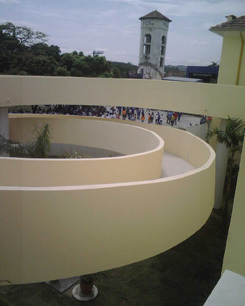 The High school offers fourteen classrooms for forty students, each, computational laboratory, science laboratory, library, two rooms for multiple uses, an auditory for one hundred and twenty seats, open spaces for leisure, a student association room, and a complete industrial kitchen. 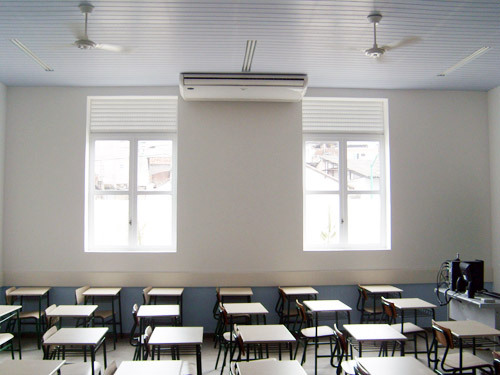 - Garbage recycling habits to be spread since the childhood. 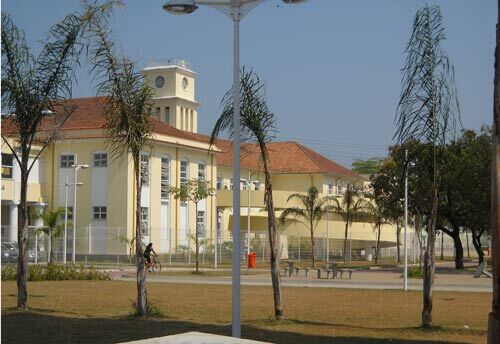 The Gymnasium/Swimming Pool complex, nearby the school, offer its students gym and sports classes and should be used by the lucky surrounding community during the weekends.